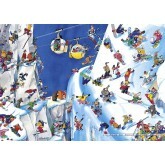 The French artist Roger Blachon is one of the most famous cartoonists in his country. He published his works in diverse magazines, but also illustrated children's books. His diversity is best shown, among other things, in that he won both the "grand prize for white humour" and the "grand price for black humour". He died in 2008. Blachon There are 3 products. 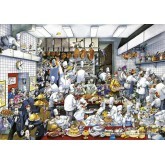 A 1000 pieces jigsaw puzzle made by Heye (reference 29565). Size: 50 x 70 cm (= 19.7 x 27.6 inch). Special series: Blachon. 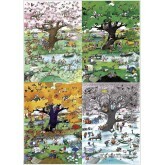 A 1500 pieces jigsaw puzzle made by Heye (reference 29130). Size: 58 x 82 cm (= 22.8 x 32.3 inch). Special series: Blachon.